'Tomb of Dracula: The Complete Collection Vol. 1' review: a Silver Age horror masterpiece – AiPT! The tomb has opened, and Dracula lives again! Vampires have been a part of pop culture for what feels like an eternity. Folkloric tales aside, modern vampire stories can all be traced back to the beginning of the nineteenth century with John William Polidori’s short story, “The Vampyre.” The character Lord Ruthven, the vampire in the story, is based on the poet Lord Byron and his immoral lifestyle. Polidori’s story led to the Byronic or Romantic Vampire…or, what you and I think of when we think of vampires. Some years later, a fellow by the name of Bram Stoker wrote Dracula which (as I am sure you already know) centered around Count Dracula, a charming undead aristocrat, who, of course, was based on the Byronic Vampire. I’m telling you all of this because Marvel’s The Tomb of Dracula, the subject of this review, is based closely off of, and clearly inspired by, Stoker’s novel. Now that our little history lesson is over, let’s get on with the review, shall we? Tomb of Dracula: The Complete Collection Vol. 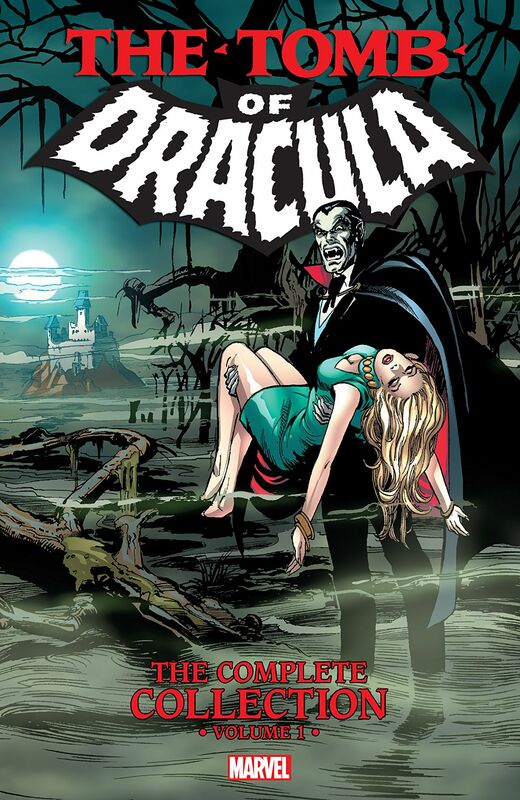 1 collects Tomb of Dracula (1972) #1-15, and Dracula Lives! #1-4. Tomb of Dracula is, perhaps, one of, if not the greatest Horror comic books series of all time, and thus, by default, this collection is one of, if not the, greatest collection of Horror comics of all time. And look, I know that what I said is a big deal, but the Tomb of Dracula – the series – really is that good. Speaking more specifically about this collection, it takes several issues for the series to really take off. Partially responsible for this slow–disconnected more so than anything–start is that the first six issues are penned by three different writers. It isn’t until Issue #7 that Marv Wolfman takes over as Horror author extraordinaire and rights the ol’ undead ship. Now, don’t get me wrong, writers Gerry Conway, Archie Goodwin, and Gardner F. Fox each did an excellent job penning memorable issues, but Tomb of Dracula doesn’t feel whole until Marv Wolfman takes over. Thus, Issues #7-15 are, in my opinion, much stronger, as a whole, than the first six of this collection. One aspect of this book–the Tomb of Dracula issues–that remains consistent throughout is Gene Colan’s stunning artwork. The man is a legend. He’s worked on everything from Daredevil to Howard the Duck and illustrated the entire 70-issue run of Tomb of Dracula. When fans think Silver Age comics they (or at least, should) think Gene Colan. His fluid style and use of shadows are uncanny, and frankly, makes this series a Silver Age masterpiece.